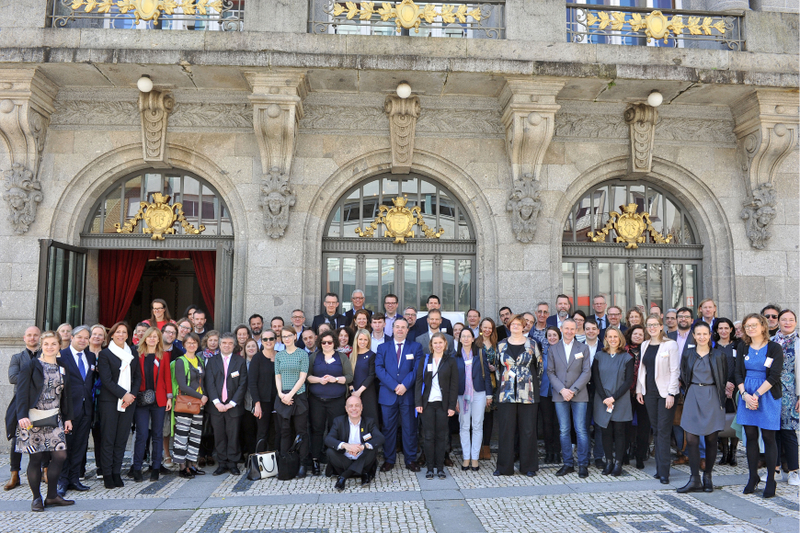 On 26-28 March, the Eurocities economic development forum (EDF) met in Braga, Portugal, to debate on how cities do shape the local economy in order to capitalise on the opportunities of the knowledge economy. 100 participants from over 45 cities, including 11 elected city politicians, shared expertise during these three days on smart and inclusive growth, investments and translating Sustainable Development Goals into local actions; focusing on SDG 8 ‘decent work and economic growth’ and SDG 9 ‘industry, innovation and infrastructure’. Terrassa, as vice-chair of the working group City Attractiveness & City Branding, explained how the CGLU network deals with SDGs, experiencing on how to use branding strategies to promote SDGs at local level. Terrassa explained wich are the priorities about SDGs based on the conclusions from the last I-Cities (Intermediate Cities) Forums in Chefchaouen (Morocco), Odienné (Ivory Coast), Neveshir (Turkey), Cuenca (Ecuador) and Terrassa. These conclusions talk about the SDGs from a local perspective witn social inclusion (role of citizens), work with the agents of each territory, generate public policies and consider the migratory background to work the common identity. On 25 September 2015, the United Nations General Assembly formally adopted the universal and transformative 2030 Agenda for Sustainable Development, along with a set of 17 Sustainable Development Goals (SDGs). The EU has committed to implement the SDGs in its internal and external policies. Some ot these goals are connected to the knowledge economy, as goals 8 (Promote inclusive and sustainable economic growth, employment and decent work for all) and 9 (Build resilient infrastructure, promote sustainable industrialization and foster innovation). 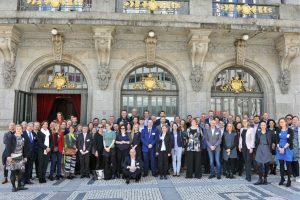 Ricardo Rio, the Mayor of Braga, and Tanja Wehsely, EDF chair and councillor of the city of Vienna, opened the conference on 27 March. Tanja Wehsely highlighted that the voice of cities matters in debate on the future EU policies and funding programme for research and innovation. 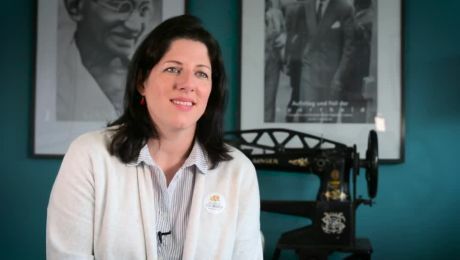 Marissa Plouin, coordinator of OECD Champion Mayors for Inclusive Growth initiative, gave a keynote speech on smart and inclusive cities of the future. She said: “People, firms and places matter to address global challenges like digitalisation, demographic change and climate change”. All these global trends give cities opportunities but bring also risks: “low-carbon transition will place new demands on firms and workers: they will be winners and losers”. Local public policies can mitigate these risks. The members debated on future EU policies and funding for innovation, and speed-networking session on innovation, long-term investments, and SDGs. – To foster smart and inclusive growth, cities need to promote a ‘race to the top’: cooperation rather than competition between cities. For instance, Nantes and Hamburg exchange companies and organise international economic missions together. – Cities public policies counter-balance the negative impact of automation and digitalisation, and use technological opportunities for improving public services, for instance thanks to data collected by censors. – Local authorities also support knowledge diffusion: investing in skills and entrepreneurship, facilitating knowledge transfer by working with companies, research centres, universities and technical schools. – Cities invest in tradeable sectors (infrastructures, manufacturing, etc.) and non-tradeable services (social housing, education, etc.) to support smart and inclusive growth and a good quality of life for all citizens. The Horizon 2020 programme has been during the last years the financial instrument focused on excellent science, industrial leadership and social challenges. The European Commission is preparing the proposal for the successor programme to Horizon 2020, called FP9. From Eurocities ask for an ambitious support for integrated urban solutions, more support of cities as driver of innovation and a programme design further adapted to local needs. The EUROCITIES paper on post-2020 cohesion policy calls for a reinforced and simplified cohesion for Europe and its citizens. How to make CP more impactful and efficient for cities? Making multi-level governance and partnership a reality or simplifying access and implementation. Economic development forum members also exchanged on the future challenges for cities and how to address them within EUROCITIES. Brian Field, professor and urban planning adviser at University College London, set the scene with a keynote on ‘sketching the future urban scenario’: developing city visions and integrated planning to implement them. Members discussed key areas of work for cities: supporting industry and innovation, including circular economy and new business models; governance and regulations; long-term investments; managing digitalisation and technology development; employment, skills and inclusive growth. They analysed how to tackle these within our network for effective outcomes. The next meeting of the EDF will focus on cities’ international economic cooperation and will take place on 17-19 October 2018 in Grenoble, France. This forum will be focused in The internationalisation of cities’ economy (new markets, international cooperation and SDGs). In 2019, the host cities will be Florence, Italy, and Munich, Germany.